Inspiring, healing, a foretaste of heaven, a fulfilment of the LOI Commitment – some of the comments from participants on the recent consultation on ‘Discipleship and Christian Formation’. Among the 60 who attended were representatives from various streams of the Evangelical and Orthodox traditions, including a number of local leaders. We sought to learn from one another in a spirit of receptive ecumenism. A fuller report will appear in the next LOI Newsletter. The mix of prayer, Bible study, reflective discussion, and presentations offered a varied diet. But it would not have succeeded without the hospitality and logistical support offered so warmly by Holy Cross Greek Orthodox School of Theology, its Missions Institute of Orthodox Christianity, and the Hotel Indigo. Pray for the LOI Board as we confer next month about what happens next; but pray also for the future of relations between the Orthodox and Evangelical traditions in North America: the consultation was a strong reminder of the potential which exists as Christians come together who uphold the truths about God expressed in the ancient creeds. I’ve not posted much lately, as we’ve been getting a newsletter up and running. (If you don’t receive it and would like to, get in touch.) But from 5-7 June 60 Orthodox and Evangelical leaders in mission, church, and school are gathering at Holy Cross Greek Orthodox School of Theology near Boston, MA, for a regional consultation on ‘Discipleship and Christian Formation’. We are grateful to the Missions Institute of Orthodox Christianity under Fr Luke Veronis for sponsorship and administrative support. We shall look at how each tradition forms Christian disciples, and how discipleship plays out in a range of areas including family, workplace, and cross-cultural mission. It’s not too late for us to take bookings for non-residents! If you can’t make it, we plan to record and upload the plenary sessions. The public event, at 7.15 pm on Wednesday, 6th June, features Bob Doll and Archbishop Angaelos, speaking on ‘Workplace Discipleship’. Everyone is welcome, there’s no need to book and no charge. For a poster, click on LOIConference. Matthew Baker and Todd Speidell, eds, T. F. Torrance and Eastern Orthodoxy: Theology in Reconciliation. Eugene OR: Wipf & Stock, 2015. pp. xi + 359. $44. This set of fifteen essays written by scholars from a wide range of theological traditions, Reformed, Evangelical, and Eastern Orthodox represents a very significant work for scholars interested in engaging with the thought of T. F. Torrance, and those who are interested in ecumenical discussion between Eastern Orthodoxy and traditions that have emerged from the Reformation. T. F. Torrance was one of the greatest theologians of the 20th and early 21st centuries. His writings are very challenging and take significant intellectual effort to probe and appreciate. Nevertheless, he stood in a significant position for Orthodox-Evangelical dialogue and cooperation, as a Reformed theologian deeply engaged with the Orthodoxy framed by St Athanasius and other early Christian writers. The book bears testimony to that interaction, including an interview with Protopresbyter G. D. Dragas of Holy Cross Orthodox Seminary, who reminisces about Torrance’s interaction with Fr Georges Florovsky. Torrance was a significant figure in reappraising Athanasian Christology positively in the light of the criticisms of it as Apollinarian – Torrance rather wanted to understand Athanasius as opposing every kind of cosmological and epistemological dualism, and he championed him as doing that. There are other personal reminiscences in the first three essays that pay tribute to the personal influence of Torrance’s scholarship on scholars of both Orthodox and Reformed traditions. Brendean Pelphrey’s reminiscences point to some of the strongest reasons why Torrance’s outlook can contribute so richly to deep theological communication between Orthodox and Reformed traditions. First is Torrance’s commitment to understanding what is rather than discussing what we think, reflecting his deep commitment to God’s being and his self-disclosure. This attitude freed him from being constrained by any commitment to one particular theological tradition, and enabled him to draw on the best of all that he encountered. Second is something that lies at the heart of the Lausanne-Orthodox Initiative: Torrance’s belief that ‘true knowledge is gained through reconciliation and relationships, not through analysis and the logical breaking-apart of things’ (p.27). In the remainder of the book will be found ‘Essays Patristic and Constructive’, on St Athanasius; realism in St Ephrem and Torrance; justification in St Cyril, with implications for ecumenical dialogue; the theology of baptism in Torrance compared with St Mark the Monk; the debate between Torrance and John Zizioulas on the Cappadocians; the concept of energy in Torrance and in Orthodox theology; the universe, incarnation and humanity in Torrance’s cosmology; a study of Torrance and Dumitru Stăniloae and their understanding of the rationality of the cosmos; and Torrance’s understanding of the Christological realism of the Coptic Church. A final section has three essays on primary sources, including his correspondence with Florovsky, and two essays by Torrance himself, on the Orthodox Church of Great Britain and on the relevance of Orthodoxy. Perhaps it is good to finish with a quotation from ch. 12 (which examines the Christological realism of the Coptic Church), also found in a letter to Florovsky on p.319: ‘I can foresee the day when there will be only one Orthodox Church serving Greeks, Ethiopians and Copts, and Reformed, within the ancient bastion of Christianity’ (p.267). Not all who read the book will agree with this sentiment, but they will find essays from people of many different Christian traditions who have been challenged to reassess their thinking because of the magisterial thought of Thomas F. Torrance, and an encouragement to engage deeply with this thought in the progress of the relationship between Evangelical and Orthodox expressions of Christian faith. I grew up in a Greek Orthodox family with a very pious and faithful mother, who loved Christ. Our family attended church regularly and participated in the Liturgy. In my freshman college year at Lafayette College, I had a deeper spiritual awakening to Christ through a course in the New Testament which was required for all freshmen at the time. I joined Inter Varsity Christian Fellowship, which enabled me to understand and practice my faith in Christ in a more personal and vibrant manner. My life was impacted greatly and I felt renewed spiritually. It was like having the type of spiritual conversion about which Billy Graham often preached. By my junior year, I felt called to study for the priesthood in the Greek Orthodox Church. When the time came for me to seek a wife, I sought a woman who would also have had a reborn experience in Christ. Pearl, my now beloved wife of 59 years, was such a person. She also grew up in a Greek Orthodox home. When she was 16 years old she attended a Billy Graham Crusade in Ocean Grove, NJ which greatly enriched her spiritual life and her devotion to Jesus Christ. This experience opened her eyes in new ways and helped her appreciate the Gospel. Her encounter with Billy Graham’s preaching led to a strong desire to grow in her relationship with Christ. She joined a Bible Study Group of a school friend who was evangelical. When she saw the great benefit from this experience, she encouraged the Greek Orthodox priest of her parish to begin a Bible Study in her own Church in Asbury Park, NJ. This was a new idea to her priest, who was a first-generation Greek immigrant, unfamiliar with Bible Study Groups. Nevertheless he consented when he perceived Pearl’s love for Christ. Pearl and I married a year after our respective graduations from college and seminary. We have since raised five children and have served a single Greek Orthodox parish for 59 years, with a strong Bible Study emphasis through seven groups taught by both of us. We also began an international Orthodox Christian mission ministry which is presently active in thirty countries. My wife’s zeal to teach and share the gospel of Jesus Christ during our ministry together started at that Billy Graham Crusade in Ocean Grove. Throughout our lives, we have both appreciated BIilly Graham’s impact on our own lives, and his witness to the world. Even though the theology of our historic and traditional Greek Orthodox faith differs from his evangelical form of Christianity, our oneness in Christ has always united us. Billy Graham’s life and ministry to all people everywhere increased our own desire to reach out to the world with the eternal gospel. We both admired Billy Graham and deeply resonated with his ministry to spread the gospel of Christ to all people. May his memory be eternal. This welcome volume is a recent addition to the Langham Monographs which examines approaches to mission in Eastern Europe where there is a strong Orthodox Church presence. The focus is on the situation in Moldova, but the ideas presented reflect the situation of Eastern Europe much more widely. The author assesses well the development of Evangelical mission in Moldova through its early history, under the Russian Revolution and later Soviet rule, and then after the collapse of the USSR. This history is helpful because it sets the context for understanding how Evangelical churches have grown and how they have developed their (mis)understandings of Orthodox Christianity. It also helps us to understand how the collapse of the USSR altered the identity and unity of the diverse Evangelical groups. The discussion is developed into a detailed examination of the relationship between the Orthodox and Evangelical churches, with a particular focus on points of tension in theology, canonical territory and aggressive evangelism and proselytism. There follows a thorough analysis of how mission is understood in different ways by the diverse groups of Evangelicals. This analysis breaks down approaches into the managerial church growth approach most particularly associated with Baptist churches, post-imperial approaches associated with the Lausanne movement under the influence of John Stott, which sees denominational distinctives between churches as positive, and an Anabaptist approaches with their focus on participation in society. The analysis of the Orthodox understanding of mission and its incarnation / kenosis emphasis lays much of the foundations for later chapters that seek to address the mismatch between approaches. These later chapters develop an understanding of the Missio Dei approach, which has had its critics in the past, but which Ubeivolc suggests may present some opportunities to develop an increased understanding between Evangelical and Orthodox approaches. The root of this understanding is that as we understand mission as God’s agenda, it becomes more possible to rejoice in the thriving of other churches and traditions; these are understood in the wide context of God’s mission. In the final part of the book Ubeivolc seeks to define how Evangelical churches can develop new approaches that can engage more positively with Orthodox expressions. This includes a more Trinitarian approach to mission, which would be not only more accommodating to the Orthodox, but in the end also a more sophisticated theology. The analysis is detailed, but its focus on Moldova does not limit its application. The jury is out on how Evangelical and Orthodox expressions of Christianity can better work together in God’s mission in the world. Ubeivolc’s analytical approach seems the right way to study the tensions and opportunities, and his recommendations need to be taken seriously, and worked into mission theology and practice. The dialogue and reflection must continue until and after significant tangible cooperation in mission is achieved. Prof Aho Shemunkasho, a participant in our Cambridge consultation for theological educators, is pleased to announce a Master’s degree course in Syriac Theology at the University of Salzburg. arts/humanities, such as of theology, history, Oriental studies and archaeology. academic, spiritual or pastoral level. Some part scholarships are available. 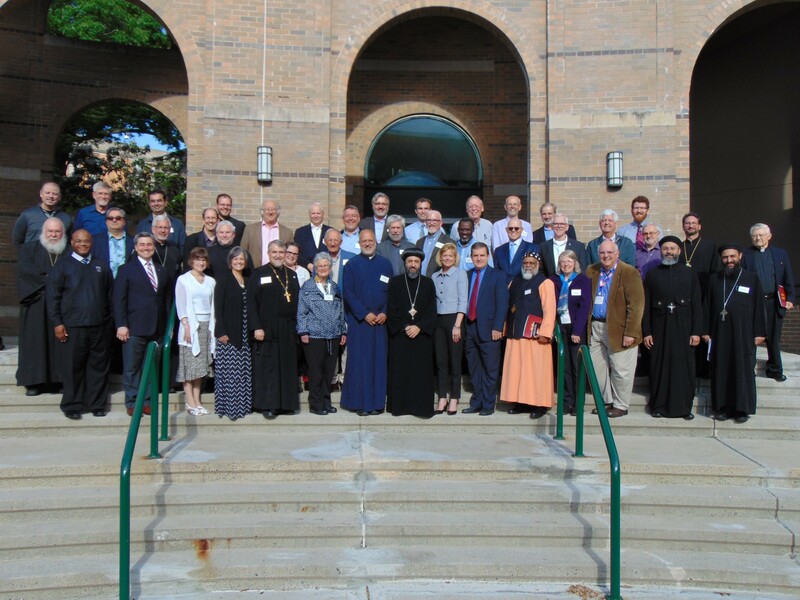 LOI is pleased to announce details of this year’s North American regional consultation, scheduled for 5-7 June at Holy Cross Greek Orthodox Theological Seminary, Brookline, MA. The theme is ‘Discipleship and Spiritual Formation’, following on from the upcoming CWME gathering in Tanzania. Sessions will explore how our respective traditions form disciples, what resources each has to draw on in this task, and what discipleship means in particular contexts. Confirmed speakers include Archbishop Angaelos (Coptic Orthodox Church), Dr Joshua Bogunjoko (SIM-USA), Dr Gordon T. Smith (Ambrose University), and Fr Luke Veronis (Holy Cross). We are inviting mission practitioners, church leaders, and theologians from Oriental Orthodox, Eastern Orthodox, and Evangelical traditions. If you are based in North America and would like to register your interest in attending, e-mail Tim Grass, the facilitator, at lausanneorthodox@gmail.com, or Jim Stamoolis, the Consultation Co-ordinator, at james.stamoolis@gmail.com. From the end of January, we plan to issue an electronic newsletter twice a year; please let the facilitator know if you would like to be placed on the mailing list. The Coptic Church Centre at Stevenage in England was, as usual, the venue for the annual residential meeting of the LOI Board. The main item we discussed was next year’s consultation, scheduled for 5-8 June at Holy Cross Orthodox Seminary near Boston. The theme is ‘Discipleship’, following on from the upcoming CWME gathering in Tanzania. As a regional consultation, we are inviting mission practitioners, church leaders, and theologians from North America. If you are interested in attending, e-mail the facilitator at lausanneorthodox@gmail.com. We also looked further ahead, and are investigating holding consultations in Cyprus (late 2019) and India (late 2020). Each will enable us to develop closer contacts with Orthodox and Evangelical leaders in a particular region. LOI is not just about consultations, however. We heard about a recent Trauma Healing initiative in Egypt in which LOI had been involved, using material developed by the American Bible Society and facilitated by the Coptic Orthodox Church. We also agreed to begin sending small ‘listening teams’ to visit countries in which relations between Evangelicals and Orthodox are troubled, in order to hear the concerns of each tradition. From the end of January, we hope to issue an electronic newsletter twice a year; please let the facilitator know if you would like to be placed on the mailing list. I couldn’t let this anniversary pass without some reference here. It was on 31 October 1517 that Martin Luther is said to have published his protest against the abuses evident in the church of his day, the ‘Ninety-Five Theses’. Churches and ecumenical bodies around the world have been marking the anniversary this year, and some have issued statements, such as that from the Archbishops of Canterbury and York. Television, radio, and print media have all been delving into this epochal period of Western history. At a local level, I don’t suppose I am the only one to have taken the opportunity to preach a series of sermons on key Reformation themes, and to try to explain ‘how the (Western) churches got to be the way they are’. And that highlights the point I want to make – that there is an ongoing need for education about the past, both our own past and that of others. Those of us who belong to churches which emerged as a result of those events half a millennium ago need to be alert to our own past, and how it shapes our present. Those whose churches did not undergo such a process of reform also need to know something of the Protestant past, just as Protestants have been encouraged to come to grips with the Orthodox past. Protestants (and Evangelicals among them) have a history. And encounters between Orthodox and Protestants, or more particularly between Orthodox and Evangelicals, also have a history. During the Reformation era, Lutherans and Orthodox made contact. Evangelical mission workers encountered Orthodoxy in its home contexts, with varying results. A friend of mine who was a civil servant reckons that if we want to know where we should go from here, a good first step is to understand how we got to where we are. LOI’s goal is ‘to reflect constructively on the history of relationships between Orthodox and Evangelicals in order to work towards better understanding and healing where wounds exist’. Constructive reflection on the past with a view to setting our direction for the future seems an appropriate way of marking this anniversary. Please pray for LOI as we seek to encourage this – and get in touch to let us know how you are doing this.